It's not always daytime in Daisytown. Regan from Floating on a Quilted Cloud sent a house set in a snow storm against a midnight sky. The orange glow from inside looks so warm and inviting though. 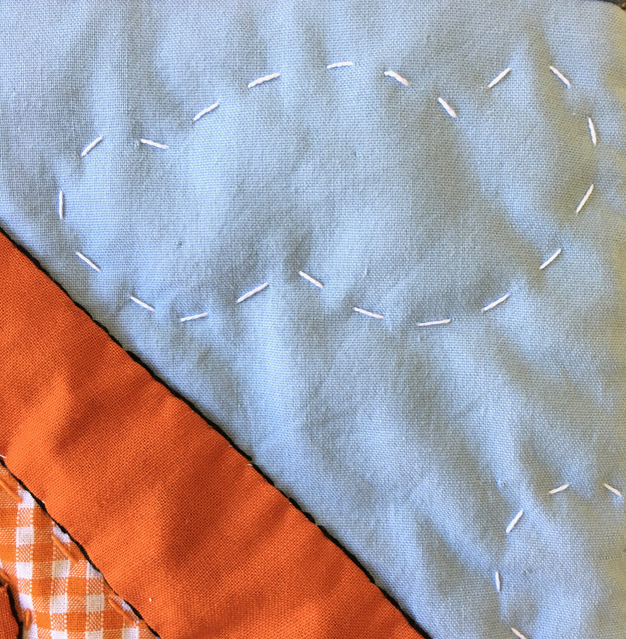 Shay of Quilting in Pyjamas always made us laugh with her blog. I seem to remember her making her house in our hot Aussie summer and has made a scene that captures that feeling. A big shining sun, deep blue skies, and a garden full of flowers. Marg of Sunshine? Paradise? outdid herself with this perfect house with a white picket fence. That's me dancing in the window. Who wouldn't be dancing if they were in such a fabulous house. The gate's open, come on in and dance with me! Mr Daisy's mum, Joan surprised me with this wonderful house that looks as though it's straight out of a fairy tale. I'm sure the roof is made of gingerbread. She knows my favourite colour is orange. Joan - Mr Daisy's mum!! 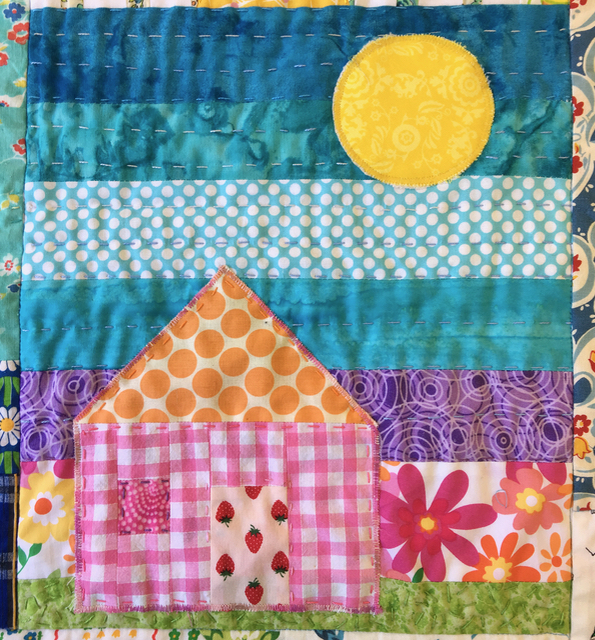 The house is set against a clear blue sky but I quilted some fluffy clouds in the sky. 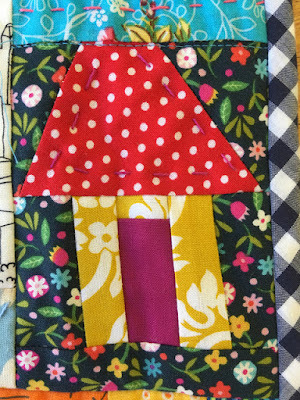 This delightful block by Melissa of Clothwork is is jam packed with fussy cut details. The air is full of springy scent of flowers. Happy girls playing in the garden and birds singing in the trees. I love the car parked on the front lawn. 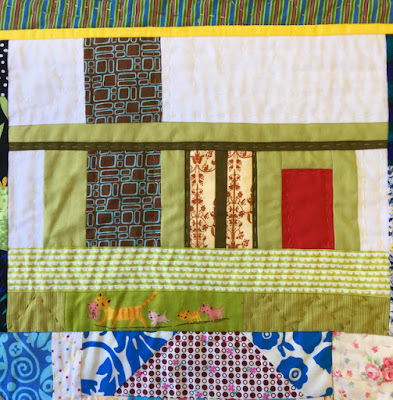 Jan of Sew Surprising made a mid century modern home. How perfect is the chimney fabric and red is always a welcoming colour for a door. And another little cubby house by me. 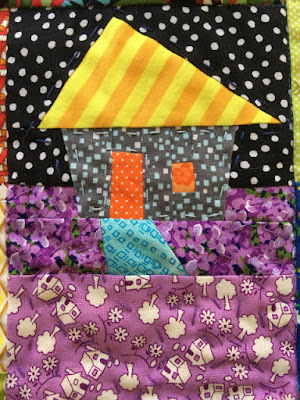 This round of houses were made by lovely quilters who don't blog anymore, and even one who never did. You can still out more about them in the Friendly Friday posts in the links below or read their old blog posts, there's lots of great posts to explore. What a lot of sweet houses,like it. It is such a happy neighbourhood you have there Rachael! I love the mid-century modern one especially! It is interesting to look at all the little details that went into making each and every house. They are all different and one of a kind! 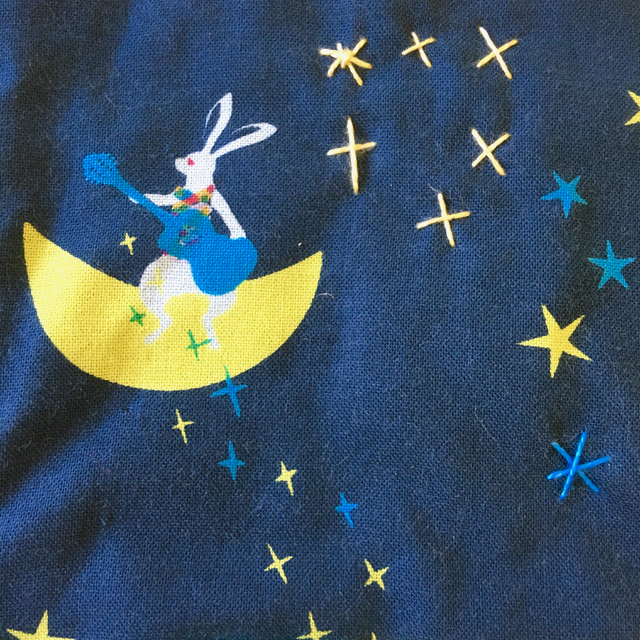 What a precious quilt!! Every house is sooo cute and I love all the colors ! They sparkle ! so fun to have an up close tour of these cute houses. like their makers they are each unique and special. 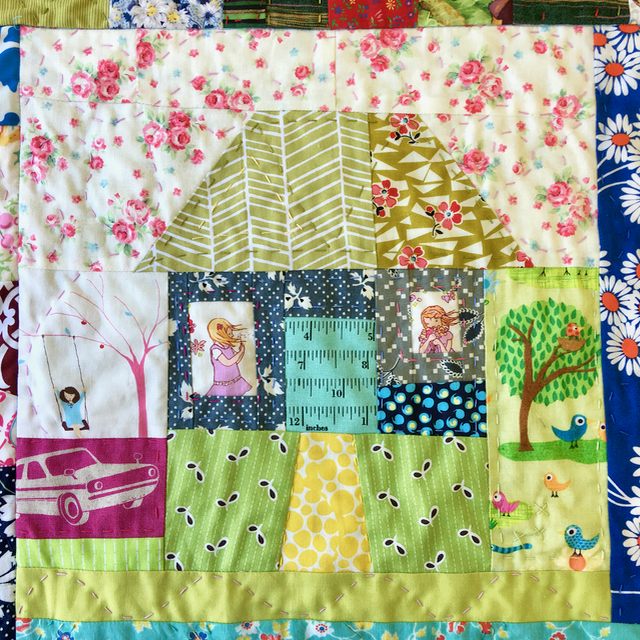 lucky you to have such a great quilt made by so many quilty buddies. They are all adorable. 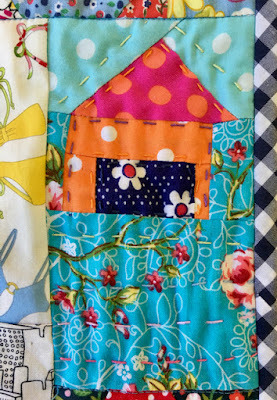 It makes me want to move into a little silly house and start sewing! I'm afraid we have lost a lot of bloggers to Facebook and other faster paced social media. I'm happy to be stuck in the slow lane! Thanks for sharing. 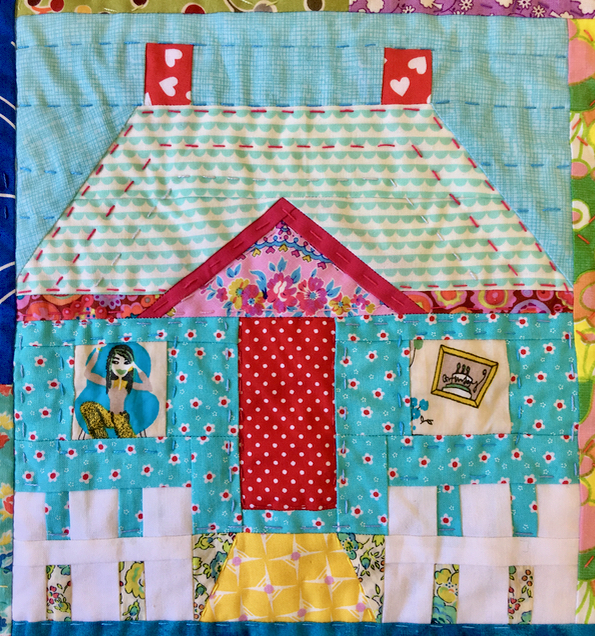 Your house-making friends seem to have channeled their inner Daisy -- the houses are all so jolly! Your stitching is making them even more special. Happy, funny houses, a whole village where quilters could gather and live in peace! Each detail is well chosen and make us lokk at them over and over again. I just went back and looked at all the posts I missed while I was away. 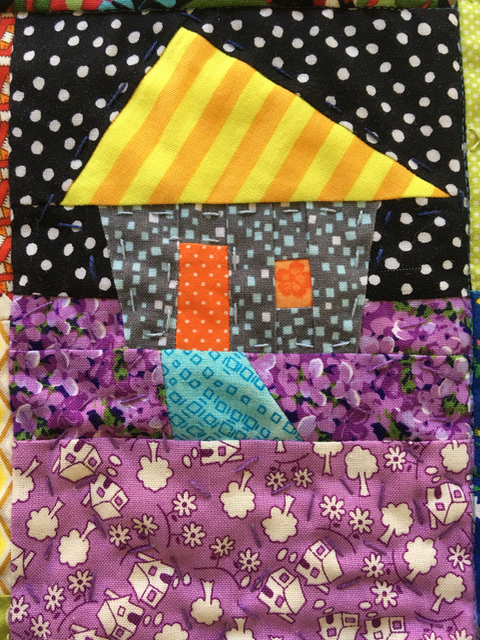 What a great group of houses you received!This is going to be a very colorful quilt! They are all wonderful! Looks a happy place, with amazing variety & lots of detail! I have always loved drawing houses as a child, two windows and a chimney with smoke curling into the sky, central front door and a pitched roof. A place to be safe and secure with the wind whistling outside and rain on a tin roof. Now it's a place where I can shut out the frantic world and stitch and sew and create. Houses are not always homes but you can make a home anywhere the heart resides. Your fellow sewers have gifted you such lovely homes. These little houses are fascinating! Love all the different styles and fabrics used. Cute little houses made by creative wonderful quilters. Another fanciful collection of houses, made even more fun with your big stitching. Looking forward to seeing the whole quilt someday. Lovely ! So many clever ideas for using prints. 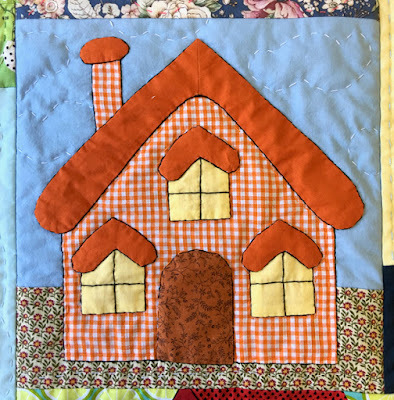 Your enthusiasm for color is contagious and everyone who joyfully made you a house had fun sharing your wimsikal approach to quilting. 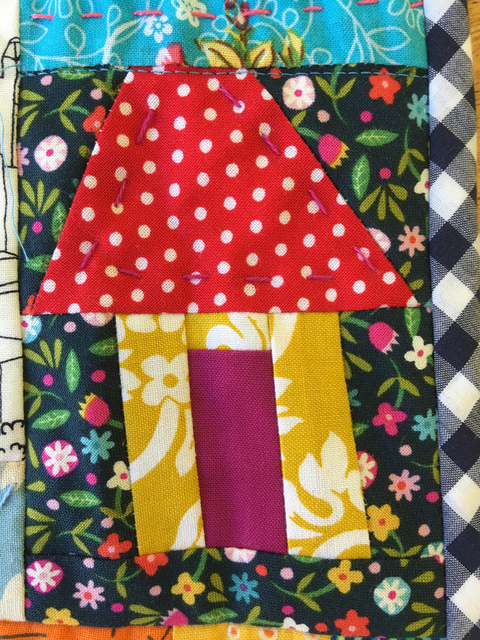 Glad I got to play with so many happy quilters. What fun houses Rachael....love the one with you dancing in the window! More gorgeous houses - it's so lovely to see them and hear their stories. Such a fabulous variety of styles and fabrics used. What fun house blocks!! Great details and each one unique, that's really neat. I went to this shop which Deliver Flowers and looked through the glasses - the flowers look so fresh, various kinds and various vivid colors. So pretty that I fell in love with them right away. After another minute watching them organizing a fresh new bouquet for a customer, I also got one.